We’ve all seen the disturbing images of refugee camps from around the world. Those refugees are deserving of attention. But what the world has largely ignored are urban refugees, who often blend into the chaos of city life and aren’t so visible to the media. Urban refugees have fallen even further below the radar. In anthropologist Michael Agier’s critique of the refugee camp apparatus, Managing the Undesirables, he reminds us that camps can be devices of exclusion (Agier, 2011). The United Nations High Commissioner for Refugees (UNHCR) estimates that 60% of the world’s 19.5 million refugees and 80% of 34 million internally displaced persons live in cities, and most of these cities are in developing countries, the majority in Africa. So, refugees in cities matter, but are often not the focus on media attention. In excluding urban refugees in the developing world from the majority of research and media coverage, we are excluding a significant portion of the world’s refugees. What are the repercussions the Eurocentric focus for refugees outside of the media’s hot zones? This summer I attended the World Refugee Day events on June 20, 2016, in Yaoundé, Cameroon. In emphasizing the crisis to a large stadium full of refugees from approximately 15 African countries, several of the speakers focused on the Syrian crisis and those who were drowning at sea while trying to reach Europe. These discourses were largely greeted by silence. However, when the President of Refugee Women in Yaoundé, a Rwandan refugee who has lived in Yaoundé for over 20 years, took the stage, she made it clear that because of the neglect of attention to urban refugees, situations were dire in the often crowded urban slums they were living in. She suggested that the lack of focus and support on urban refugees in developing countries across Africa has impacts for the future, on refugee women’s ability to become effective and contributing members to whatever society they end up in. Their potential to “hold their heads high in dignity” was being lost. This was followed by the President of the Refugee Collective, a Chadian refugee who had been in Cameroon for about as long. He argued that while it may seem that peace had returned to some of their countries, until you put yourself in the shoes of a refugee and understand the persecution they were fleeing, it would be hard to be able to comprehend why they did not want to go home. In today’s increasingly violent world, these “old” refugees, those not living in camps, are being forgotten. Sometimes they are even actively told to go home. Their countries are now peaceful. There are other priorities now. A glimmer of hope however, the situations of urban refugees in developing countries have not gone entirely unnoticed. The United Nations High Commissioner for Refugees (UNHCR) 2009 policy on urban refugees and later report on alternatives to camps (2014) call for increased protection space, legal support, and advocacy with host country governments to build the resilience of urban refugees. Don’t get me wrong, I have been heartbroken by the current situation in Europe. It is just that I was desperately hoping that the attention and focus on refugees globally would allow us to look at some of the related issues we should have been working on years ago. There are already so many displaced persons in the world, even before they flooded the gates of Europe more recently. But as countries like France are in the midst of plans to open up their first refugee camps, what can we learn from those who have been displaced for years, and how they have been able to rebuild their lives? Reiterating points made by Agier (2011), I suggest that camps, while well-intentioned, are hurtful rather than helpful solutions. Perhaps we should instead finally shift our attention to urban refugees in the developing world. In supporting and learning from urban refugees who have often spent decades figuring out their lives in displacement, I imagine we will be presented with some alternative solutions. We could leverage their wisdom to support the influx of new arrivals as people worldwide continue to be uprooted and chased from their homes. Kelly Yotebieng, MPH has spent over thirteen years living and working in Central Africa region on issues related to maternal and child health, psychosocial support, and humanitarian programming with refugees and host populations. She is currently pursuing her Ph.D. in Cultural Anthropology focusing on resilience among urban refugees in Cameroon. This blog post was originally posted at http://carfms.org/blog/urban-refugees-the-hidden-crisis-by-kelly-yotebieng/ It is republished here with permission from the author. 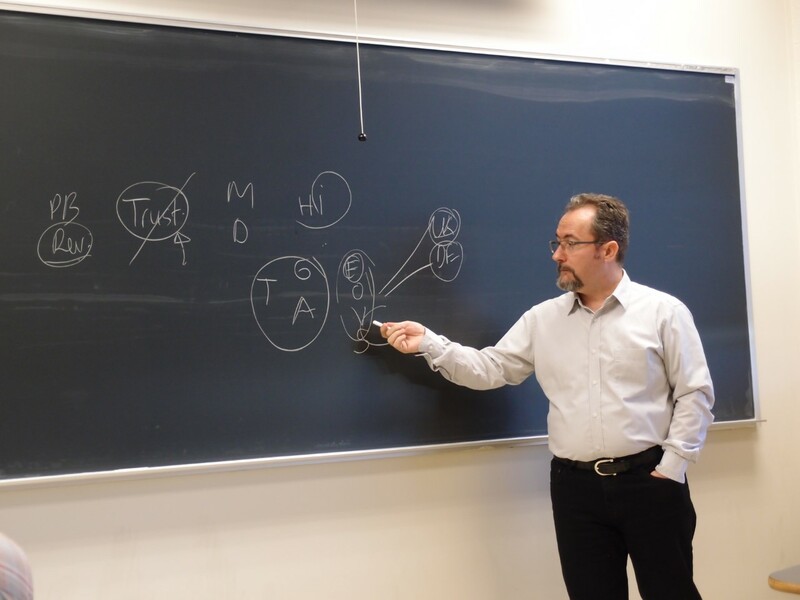 On Tuesday, 25 October, Dr. Ibrahim Sirkeci came to Anthro 5626 “Culture and Economic Life” class. He gave a talk on his research, where he aims to bridge migration and marketing through the framework of transnational marketing. Dr. Sirkeci argues that migration is always a challenging event for individuals who move. When people move they lose their social networks, or they might become less strong as a result of relocation. This alters consumer behaviors. In communities of origin social networks are helpful because they employ the notions of trust in interpersonal communication; and they are easy to reach. Social networks mean that you can ask family, kin or friends for advice and help when you need to fix a problem. As such, social networks facilitate consumer choices and save people time and money. When someone moves, he/she might not employ resources of social networks for advice and support; and dealing with small and big problems becomes much more challenging. Being stripped off networks, movers spend more time looking for solution and probably spend more money on it. Dr.Sirkeci also spoke about food tastes, and their meaning for people who move. When a person grows up in a specific culture, food tastes become deeply embedded. Upon relocation, movers start looking for familiar food items and know tastes in a new place. A simple question like “Am I able to find a proper Feta cheese or good coffee?” becomes meaningful for experiences of new immigrants. Demand for tastes drive emergence of ethnic businesses like cafes, restaurants or food markets. Ethnic entrepreneurs first build upon resources of their communities to develop awareness, loyalty and trust. Over time new food items move beyond the niche markets in ethnic communities because the product starts appealing to tastes of broader society as well. Busy schedules of people who live in global cities make them likely to ear out a lot. As such, “global villagers” value variety of tastes and food experiences. Overall, this leads to emergence of fusion food and gradual shifts in consumer tastes. Dr. Sirkeci provided a fascinating example of the history of doner kebab, shawarma, gyros, and tacos. Originally Turkish, doner kebab outlets were introduced to the U.K. by Kurdish refugees who spread all over the country due to resettlement policies. Currently there are over 15,000 small businesses selling doner kebab in the U.K. Doner kebab is affordable and prevalent everywhere. As such, doner kebab became one of the favorite street meals for Brits elsewhere. No other topic currently occupies the public and political mind in Europe as much as migration. In East Central Europe, responses have been particularly forceful. The lack of tolerance and empathy towards migrants might seem strange in view of the fact that East Central European societies have a long history of emigration. In my talk, I will argue that the politics of emigration helps to explain why there is such a close relationship between nationalism and the treatment of migrants. I will go back to the time of overseas emigration in order to trace the longue duree of social fears connected with emigration and the emerging political responses to it. The modern state displays a deeply instrumentalist attitudes towards migrants, whether leaving or entering. Ulf Brunnbauer is the managing director of the Institute for East and South East European Studies Professor of History of Southeast and Eastern Europe, University of Regensburg. After receiving his doctorate in history at the University of Graz in 1999 with a thesis on household structures and economics in the Rhodope mountains in the 19th and 20th century. Ulf Brunnbauer moved to the Eastern Institute of FU Berlin in 2003. In 2006 he conducted a study of the communist social policy in Bulgaria from 1944 to 1989, and in 2008 he became the Chair of History Southeastern and Eastern Europe at the University of Regensburg. At that time he also took over the management of the Southeast Institute. Since January 2012, he has been Executive Director of the Institute of East and Southeast European Studies. Ulf Brunnbauer’s research revolves around the social history of the Balkans in the 19th and 20th centuries with a special emphasis in the historical genealogy and migration history. Moreover, he deals with issues of nation-building, with Muslim minorities in Southeast Europe and the history of historiography in the region.